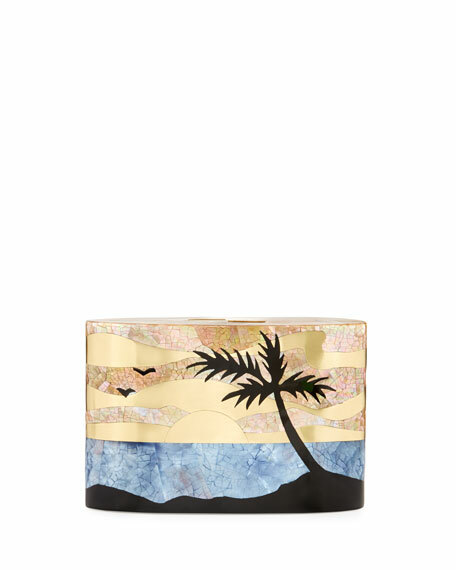 Rafe hard-shell flask minaudiere with golden hardware. Mother-of-pearl shell and metal form landscape design. Removable chain shoulder strap, 22.5" drop. Hinged bottom with magnetic closure. 5"H x 7.5"W x 1.8"D.
Rafé Totengco founded his namesake handbag collection in 1997 and has since expanded his line into an award-winning global accessories brand. Drawing from the eclectic mix of influences found in New York City, Rafe has earned loyal fans for its sophisticated, accessible, and functional designs. Everyday totes, special-occasion clutches, and small accessories are crafted from beautiful materials for a timeless, enduring quality. For in-store inquiries, use sku #2114190.